GIS software’s basic purpose is to develop, analyze and store the geographical and spatial data of any kind. The GIS software can be used in the production of various kinds of geographic information like maps. It can be a valuable tool for an organization which wants to display such spatial data. A GIS software stores this data in the form of lines and points. The most important thing for a GIS software is its relational database that helps in the development of the final image. Maptitude has a strong relational database which can be used by the developers. The software allows the easy creations of the customized map view which can be used for presentation. Another feature of the software is its explicit control of the factors like scale. Layer control is extensive in Maptitude allowing the control of the colour and font of the layers. It also involves the change in the scale of the layer as per the main scale. Geocoding is also simpler as the software allows pinning of multiple geocodes without any hassles in the process. Price of the software starts with $695 and can be varied depending upon the number of users that will be working on the software at any time. 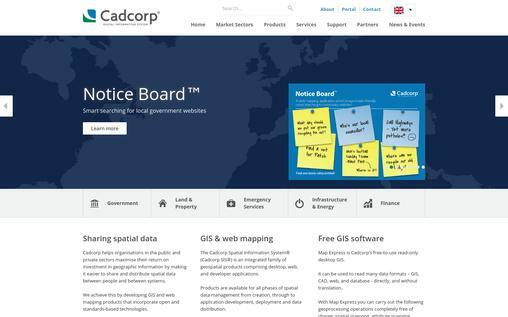 CadCorp offers the range of solution to meet the GIS requirement of the organizations. Two major tools offered by them include Cadcorp’s spatial information system(CadSIS) and MapExpress. While CadSIS is the software that can be utilized for building up of the maps, the MapExpress is the free counterpart that can be utilized for reading the maps. CadSIS comes with the host of the developer features for the desktop version which allows the easy creation and configuration process for the maps. The software also allows the organizations to select the server for the storage or retrieval of the data depending upon the budget of the company. Product comes with many extensions which can be used for different purposes like address mapping, loading of the Gazetteer data, editing of spatial metadata etc. This Software has been utilized by both the government and the private sectors currently for their GIS needs. The GIS software by ESRI comes with the host of solutions which can be utilized by the organization and can be customized as per their need. The software includes a desktop version, a server version, a developer version, and the solution tools. These make it a perfect choice for many of the companies, and that’s why perhaps the software has been adopted by many countries’ government. Some of the examples where the software is being used are a transportation system, natural hazards, voting system etc. The software allows the easy development of maps using the existing database which can take the inputs in 70 different forms. 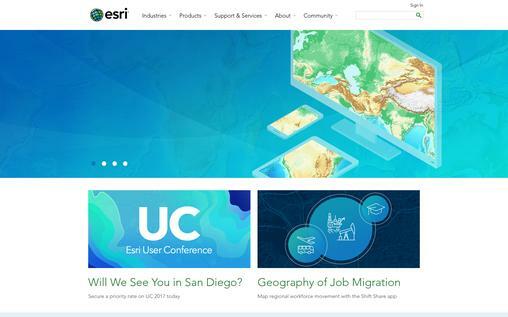 ESRI’s desktop version allows geocoding of the information. Presentation of the information in the customizable form is also possible in the maps developed by this software. Last but not least, the software allows to customize the information that the client wants to see. 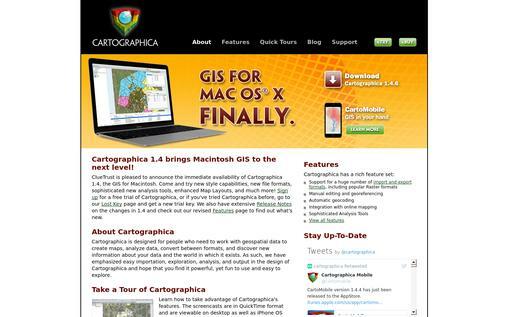 While the software discussed above are mainly for the windows, Cartographica is the perfect solution for the MAC. The software starts with the price of $495 and comes with a range of possibilities that can be utilized by the developers. Flexible import of data allows the use of the wide range of files for conversion to the map, making the life of the developer easier. Like Windows software, the Cartographic also allows the customization in terms of the view of the map. Even touch up is also possible directly on the map. In order to help the developers, the software allows undoing support which erases the changes made and brings back to the original file. This nullifies the fear of rework because of a mistake. The software allows simultaneous browsing of the map as well as the data. The Integraph is the range of services offered by Hexagon safety and Infrastructures which are made for the government as well as the private players to help them in the work. It has Integraph’s Computer Aided Dispatch is the GIS-based software for the mapping of the incidents. It allows handling and dispatch during some kind of incidents along with field mapping and data reporting. This software has Integraph’s G/Technology uses the GIS software to present the location-based information about the different locations to the clients and the customers. 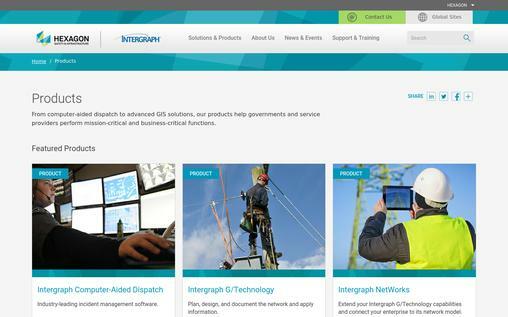 Integraph Networks allows the enterprise to access the data for location-based engineering across the enterprise. 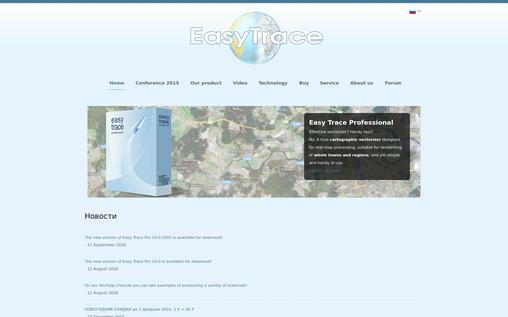 The EasyTrace software is another GIS solution which comes in both free and pro version. This downloadable format is perfect for all kinds of the GIS related need. While basic features of viewing and geocoding are available in the free version as well, the pro version has many helpful features which are listed below. The software allows for the image processing customization as per the need of the user. Automatic tracking and object recognition are two tools which save a lot of time and makes the life of the developer easier. The Pro version of the software is equipped with these tools. Editing or Touchup is also possible in the Pro version of the software. Ease of operator’s work is the highlight of the whole software which allows the use and development of the vector images from the software. ClarkLab is another of the company which offers the best GIS software solution to its customers. The company’s software also known TerrSet uses IDRSI tools along with other features. The software comes with around 300 analytical tools which make the analysis of the information easy. It has an image processing system inbuilt to enhance, restore, transform or classify the remote images. Climate change modelling and earth trends modelling are also possible with the help of the tools supplied by the software. GeOSIRIS also allows the maps to be utilized to see the impacts of the national level REDD program. The software can be used to read the engineering and the survey data to automatically create the 3D version of the map. Allows the analyses in 2D as well as 3D for the maps developed. 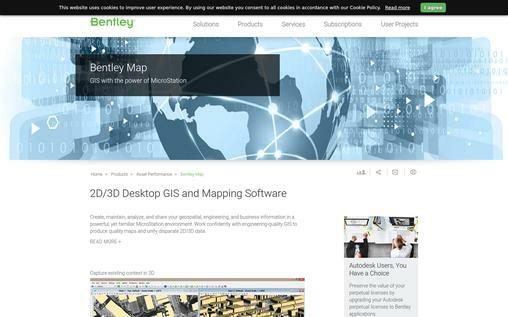 Bentley allows the development of the analysis tools in C/C++ language as per the need of the situation. Also, this powerful tool makes the customization process easier. It allows the publishing of the cartographic maps which are readable and understandable by the general public. Further, they can be directly printed with the help of the software. Raster data can be analyzed and manipulated with the help of the software. Plus, this can help in adding the visual effects to the existing projects. Map Business is the online mapping software for the businesses which allows the businesses to use the maps and spatial distribution for different purposes. Business map visualization solution allows the mapping of the different branches, customers and competitors for ease of business mapping solution. Sales territory mapping is also a utilized feature for the mapping software. 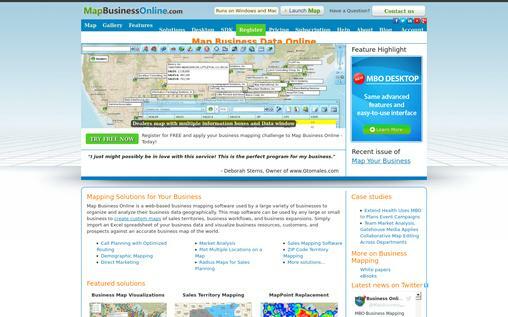 Map Business Online provides the updated street data and other information required for the GIS display of the mapping. The software also allows the route optimization for better planning of the calls. 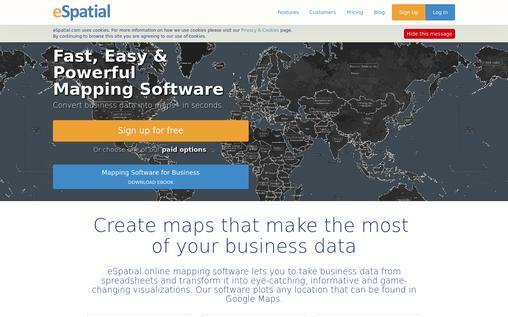 eSpatial, unlike the above software, is an online mapping tool which can be used to develop the maps without any hassles. The best part is that the software can directly convert the excel sheets in the geographical map points. Software allows the collaboration of different people in the development of the final maps. It also helps in the sharing of map privately or via online channels. Printing is one of the options that is available in the software. Moreover, the high-resolution image of the embedded maps can be easily printed out for future use. The various uses of the software currently involve the development of the route, development of the territory map, color coding of the areas, heat maps etc. These host of tools ensure that the software can serve almost every purpose of the organization. In the current times, GIS software is essential for most of the organizations. Further, whether it be locating different warehouses, competitors or assessing the effect of some change, the GIS software can be quite helpful for an organization. 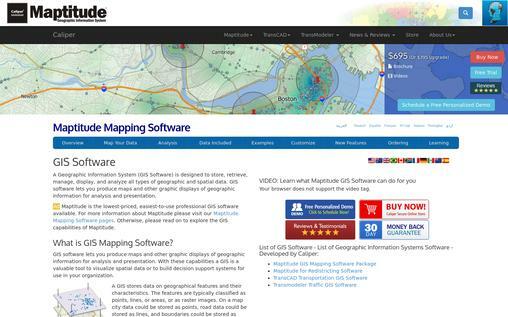 The above software lists out the major features that different GIS software offers. The best software for the company shall be selected as per the features required by them.